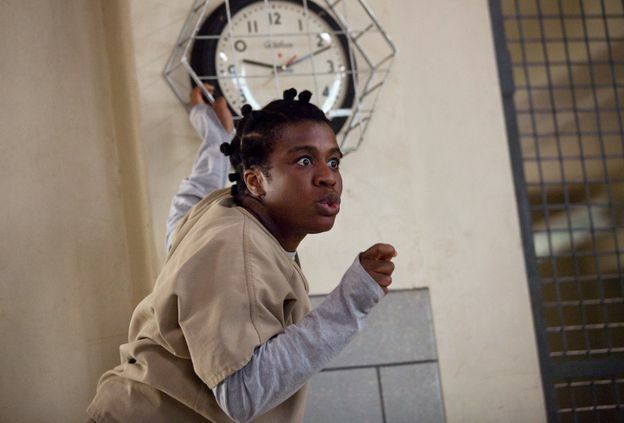 Crazy Eyes's signature bantu knots add to the offbeat vibe of her character, and in season two we learn the back story of how she came by them as a child. It turns out that Aduba actually auditioned for the role wearing those knots, and Kohan loved the look so much that she opted to write them into the show. If you've ever seen Aduba on a red carpet, you know she is gorgeous. You can credit the makeup team for hiding it. "We mess her up pretty badly," Bigger said. "We go in and make her all splotchy."